50 years after the great smog, a new killer arises To cover up the true extent of the smog disaster the government invented an influenza epidemic. In fact research has shown there was no epidemic and that the thousands more people who continued to die for the next four months did so because of the air pollution. ....To maximise revenue the UK was exporting its clean coal and keeping the sulphur laden "dirty" coal for UK power stations and domestic fires. 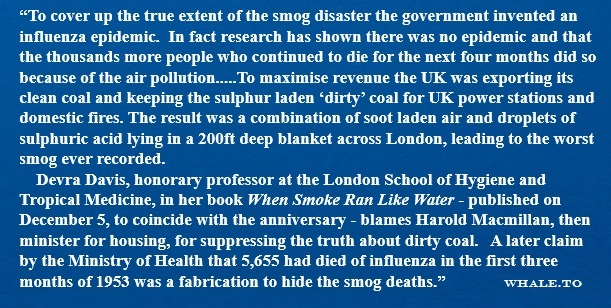 The result was a combination of soot laden air and droplets of sulphuric acid lying in a 200ft deep blanket across London, leading to the worst smog ever recorded. ......Government estimates are that 24,000 people a year had their lives shortened as a result of air pollution. ...In 1950 there were 4m vehicles registered in Britain, half of them cars; now there are 28m vehicles, 85% of them cars. Coal provides only 15% of energy for home heating. ......"We have defeated one problem only to create another, and like the government of 1952 this one has yet to come to terms with the problem,"